the Muse’s Mail Bag: What’s Your Night Time Regime? I snatched up the first e-mail that caught my attention today out of the mess my inbox is! Eep! Nell from Colorado was curious about my night skincare regime. I was curious what sort of products you use prior to heading to bed. Thanks for the e-mail Nell. My nighttime regime hasn’t changed since Philosophy introduced their Miracle Worker Pads. I pretty much embrace the entire Philosophy Miracle Worker Collection for my night time skincare although I do, from time to time, switch things up and use an Asian Sleep Mask, a whitening agent, or serum. It don’t always stick religiously to the same thing because sometimes I’m busy testing new products but the best results I get are from the Miracle Worker products so I try to stick to them when possible. My skin is dry at the moment with no sensitivities and an occasional rare pimple but clear about 98% of the time. I start off with the Philosophy Miracle Worker Pads (obviously all of this is on a freshly cleansed face). I follow up with the Miracle Worker Miraculous Anti-Aging Concentrate and end with the Miracle Worker Anti-Aging Moisturizer. Philosophy didn’t create the moisturizer as a night cream however I embrace it as such because I find it’s way too heavy and rich for day use. My eyes creams get switched around alot but at the moment I really love slathering on a good deal of Rare Minerals Active Triple Eye Cream. It’s truly a shame this is gone as it really deals well with my puff during night use and I wake up with way refreshed eyes. That’s about it. Like I said it does change around a fair bit particularly when I’m using sleep packs, whitening agents, or other serums, lotions, and potions. But for the most part Miracle Worker, is indeed just that, a miracle. My skin looks its best when I embrace this routine! Feel free to share your night regime with Nell! 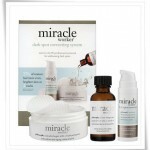 I began using the Philosophy Miracle Worker collection in December and I love it also! The only of the Miracle Worker collection I don’t like is the eye cream; it seems that no matter what eye cream I try I always return to Estee Lauder’s Advanced Night Repair eye. I’m still a young adult, and although I LOVE reading about makeup and beauty products, I don’t actually use a lot myself since I don’t really have time in the morning and that I find myself too exhausted to wash it off at night. With that said, my night routine is as simple as it can get: cleanser and moisturizer. The moisturizer I use is the Clinique Dramatically Different Moisturizing Lotion. ponds, vitamin e toner from the body shop, night of olay night cream. I’m such an old woman. I wash my face with either philosophy purity or their scrub face wash. I use Makeup Artist’s choice retinol serum every other night (LOVE!!). On the off nights I use Korres Quercitin and oak moisturizer. Oh, and lip balm, Alba I think. Also, I LOVE Mychelle’s eye cream. A few yrs ago I broke out in a horrible scaly rash on my eyelids and arms, and the eye cream cleared it all up! Very gentle, and it’s a miracle cream, I swear! It saved me! Hehe I use a little of everything & no two nights the same but usually a good deep cleanse & toner, a treatment, a rich moisturizer or facial oil, and an eye cream. rose sometimes I feel that way when I’m testing a huge round of skincare ;D! I love the concept of Philosophy skin care, but after purtiy burnt my skin, I haven’t tried anything else in the line. Muse, do you use your Clarisonic every night? I know you have dry skin especially in the winter so was wondering how often you use it. shower in the AM Mary ;-D but never in the evening. I find it’s messy to do it over the vanity sink so I prefer doing it in the morning in my shower ;D! if it works for you cj, do it ;-D! so long as you see results ;D! Wash my face with Cerave and that Wonder Cloth thing. Then Peter Thomas Roth Retinol PM. If my face is particularly dry, I’ll add Peter Thomas Roth UnWrinkle Night. Pretty simple night time routine.